The World Health Assembly (WHA) concluded its 68th session in Geneva on May 26 with Union Minister for Health and Family Welfare JP Nadda, the president for this year’s assembly, saying ‘thank you’ to delegates in seven languages: merci, gracias, obrigado, shukran, spasiba, xie xie and thank you very much. The concluding session with its thin attendance from the member states, NGOs and journalists stood out against the inaugural session—an event bustling with activity and the Salle de Assembly bursting at seams. Did it indicate that the people were disappointed with the outcomes? No, just that the participants, exhausted after negotiations, shouting and strategizing couldn’t wait to leave the premises at the first opportunity. Politicians, not known to be left behind in hyperbole, didn’t disappoint in their speeches both at the inaugural and the concluding sessions. “The 68th WHA will be remembered by posterity for these crucial decisions which will shape our collective efforts in the years to come,” said the Indian health minister at the concluding session. Michael Malabag, Minister of Health of Papua New Guinea and Chairman of Committee B (WHA has two Committees: A and B with certain thematic debates under each of them), gave the audience a laugh when he said that the President of WHA kept referring to him as Dr. Michael Malabag, when he is not a doctor, and the media in his country is fine with it as long as he doesn’t go back home and start practising. As usual, the range of resolutions adopted at the Assembly were wide: a new resolution on a global action plan (GAP) for combating anti-microbial resistance, resolutions on WHO’s reforms for response in emergency situations, a resolution on poliomyelitis, yellow fever mapping and vaccination for travellers, a resolution on global vaccine action plan (GVAP), the impact of air pollution on health, framework for non-State actors, communicable diseases (dengue and malaria), 2014 Ebola virus disease outbreak and follow-up to the special session of the Executive Board (EB) on Ebola, implementation of international health regulations (IHR), programme budget for 2016-2017, health in post-2015 development agenda, among others. These draft resolutions were debated under Committee A. Most resolutions under Committee B were of administrative and budgetary in nature. They included financial reports and audited financial statements, status of collection of assessed contributions, scale of assessments for 2016 and ‘17, reports of the external auditor, appointment of external auditor, WHO staff pension committee, salaries of staff in upgraded posts, amendment to the staff regulations and rules, etc. There was also a resolution on health conditions in the occupied Palestinian territories, including east Jerusalem, and in the occupied Syrian Golan. Some debates, on health systems and non communicable diseases (NCDs), were shifted from Committee A to B during the course of the week, including strengthening emergency and essential surgical care and anesthesia as a component of universal health coverage, WHO global code of practice on international recruitment of health personnel, sub-standard/spurious/falsely-labelled/ falsified/counterfeit medical products (SSFFC), global strategy and plan of action on public health, innovation, and intellectual property (GSPOA), maternal, infant and young child nutrition, global burden of epilepsy and need for a coordinated action at the country level to address its health, social and public knowledge implications, etc. Notwithstanding the importance of the adopted resolutions, the volume of the texts agreed upon in the WHA necessitates that we focus on some of the more salient resolutions and its implications for the global health regime, to ensure that we emerge from this diplomatic maelstrom unscathed. The focus of this year’s Health Assembly, understandably, was on Ebola and health-related emergency response, after the poor and delayed response of the WHO under its present leadership during the Ebola outbreak. Amid cries for her resignation, Chan promised to make “landmark” reforms for preparedness in dealing with future health-related emergency situations. Consequently, there were five major areas of reform in emergency operations—a single new programme for health emergencies, uniting all outbreak and emergency resources across the three levels of the Organization—country, regional and headquarters level; plans for a global health emergency workforce drawn from the global outbreak alert and response network, the global health cluster, foreign medical teams, and others; performance metrics for the emergency programme; developing new business processes to facilitate a rapid and effective response including, developing streamlined administrative and managerial procedures for logistics, procurement, and emergency staff recruitment; a $100 million contingency fund, financed by flexible voluntary contributions, to sustain immediate response for a period of three months which can be stretched to a maximum of six months. The new emergency programme under the DG’s direct supervision will have performance matrix of what needs to be done in the first 24, 48 and 72 hours and will also have a roster of experienced emergency coordinators from across the entire organization who can be deployed quickly to lead field operations and national disaster teams who in turn can be swiftly stationed in the areas of emergency operations. India committed $2.1 million voluntary contributions to the global health body towards the new WHO contingency fund, the pooled fund for implementation of R&D demonstration projects and for the member state mechanism on SSFFC medical products. The emergency programme was debated for long hours on May 19 and May 20 and finally reached consensus on May 23. However, even though the new emergency programme has been adopted, operationalizing it will be a major challenge. Consider this: most of the international responders for the Ebola outbreak were drawn from China, African Union and Cuba. India, for one, had not responded much to the Ebola crisis. Ebola has run into a huge financial stalemate even though the outbreak had reached the shores of powerful western nations. “There is no reason why Ebola can’t be beaten but financing is becoming the most essential glaring reason for failure,” said Bruce Aylward, WHO Assistant Director-General for Emergencies, at a press conference on May 26.
WHO is currently facing a funding gap to the tune of $100 million for Ebola response. “Money is falling faster than cases,” said Aylward. “Last week it was 11 days that I stopped deploying international staff in Sierra Leone. That is how tight financing was,” he added. WHO will submit, what it calls a “bare bones” budget, to the Secretary General’s Office, who will “go out and beat the drum again to get that financed”. Apart from that, the World Food Program’s (WFP’s) special operations that is underpinning the response right now, needs $50 million to “to keep those helicopters in the air and to keep those operations working,” said Aylwards. “The failures such as they were of WHO’s response to Ebola are a large part a consequence of a funding freeze which has been operating with increasing strangle-ment over the last 20 to 30 years,” said David Legge of the People’s Health Movement (PHM). To understand this statement one would have to study WHO’s funding mechanisms. There are two sources of funding for the WHO: assessed contributions i.e., mandatory contributions of member states and voluntary contributions that is further divided into the two types of specified or earmarked contributions and core account, flexible contributions. Over the last 20 years the proportion of WHO’s budget which is met through mandatory, assessed contributions has fallen from 75 percent to 20 percent. This is a consequence of continuous new functions being added to the organization and a continuing freeze on assessed contributions. The remaining 80 percent is met by voluntary donations – the top four voluntary donors of 2014 were the US, followed by Bill and Melinda Gates Foundation, the UK and Canada. The total fund break-up for 2014 for the global health organization was as follows: voluntary contributions (core) was $133 million, voluntary contributions (specified) was $1,869 million, which adds up to a total of $2,002 million. 51 percent of the revenue for voluntary funds were by member states, two percent by the private sector, seven percent by NGOs and 14 percent by foundations. Staff and other personnel costs were the largest category of expenses and represented 41 percent of the total expenses incurred in the programme budget for 2014 down from 43 percent in 2013. “[Of] these voluntary contributions, 93 percent are tightly earmarked. They are not earmarked for things that the donors are not currently supporting. And guess what, emergency interventions were not being supported in the last two years,” said Legge. “Ebola and so many other failures and inefficiencies of WHO are consequent upon donor freeze–the freeze in assessed contributions,” said the health activist. In 2014, Bill and Melinda Gates Foundation had contributed $256.5 million as voluntary funds of which $253.6 million was specified voluntary funds and nearly $2 million for R&D. Compare this to India’s voluntary contributions in 2014: $2.67 million of which $2.58 million was specified while $35,000 was for R&D. The global health body’s priorities are hugely donor-driven, including, its R&D and its emergency focus. The freeze was partly brought about citing the inefficiencies of the WHO but even after five years of some effective reform, member states have carried on with the freeze tradition. The DG recently sought five percent increase in assessed contributions which would mark a symbolic lift of the freeze. However, Belgium and the UK both spoke firmly against this proposed increase while Germany supported it. “It’s a trivial amount of money, actually. Just looking at the UK figures–UK contributes $24 million a year and 5 percent of that is $1.25 million. Last year they saved $13 million in terms of their exchange losses and gains in terms of their contribution to WHO. And their voluntary contributions are $65 million a year. And they are refusing to pay 1.25 million, which the DG is asking [for]. Belgium contributes $4.65 million in assessed contributions, its exchange rate saving was 700,000 and five percent for Belgium is $230,000,” Legge said. There was a big debate on increased assessment fund as part of the programme budget discussion but ended with the agreement that the budget increase will go forward but it will be voluntarily funded not from assessed contributions. “In terms of WHO’s emergency programme this was a recurring theme as well that the financing of it is highly dependent on voluntary contributions and that now needs to be a rebalancing of that with a much bigger proportion funded from assessed contributions,” Aylward told this reporter. “The DG makes clear though that she welcomes anyone who voluntarily increases their assessed contributions,” he added. So where does that leave emergency funding for outbreaks that tend to be concentrated in the creases of fragile health systems of low income countries? There will be a financing dialogue between member states in November where, hopefully, better sense prevails and assessed contributions are pushed—crucial for the WHO to deliver on its mandates. The budget discussions were tied to another important and highly contentious resolution on Framework of engagement with non-State actors (FENSA). The debate aimed to determine the rules of engagement between WHO and non-State actors (NSAs)—comprising academia, non-governmental organizations, philanthropic foundations, and the private sector. The draft resolution was not accepted by India and it proposed many amendments. The concern is that if private organisations enter into legitimate relation with the WHO it may lead to major conflict of interests, like big pharmas on the board to decide drug prices or junk food industries on the board of policies for containing NCDs. India proposed that "WHO shall not collaborate with private sector entities in the generation of evidence, in knowledge management, in information gathering and in research." The proposal was challenged by the US and the UK. India also proposed a ceiling of $50,000 from NGOs, above which the amount would go to the core voluntary fund. The rationale is that the WHO should not be constricted by donor priorities in its ability to mobilize resources. There was no consensus reached on FENSA and so it was adopted with the agreement to form an open ended inter-governmental meeting, no later than October this year, to finalise the draft framework to be submitted to the 69th WHA through the 138th Executive Board meeting in January next year. The other important resolution that captured much news space globally was the resolution on GAP for AMR. Pathogens are getting increasingly resistant to drugs, affecting treatment for tuberculosis, malaria, influenza, HIV/AIDS, gonorrhea, and common infections such as pneumonia and urinary tract infections, affecting the developed and developing countries alike. AMR can develop in human and animal health as well as through food and agriculture sectors. Chan has famously warned of a “post antibiotic era” where common cold may once again kill due to the overuse and misuse of microbial agents. Resistant microorganisms (including bacteria, fungi, viruses and parasites) are able to withstand attack by antimicrobial drugs, such as antibacterial drugs (e.g., antibiotics), antifungals, antivirals, and anti-malarials, so that standard treatments become ineffective and infections persist, increasing the risk of spread. For instance, in 2013, there were about 4,80,000 new cases of multidrug-resistant tuberculosis (MDR-TB). Also, extensively drug-resistant tuberculosis (XDR-TB) has been identified in 100 countries. While the GAP on AMR may seem a benign albeit urgent resolution to adopt, the adoption was delayed at the behest of India, who wanted more time for deliberations before the final agreeent. Consequently, a drafting group was formed who had closed-door discussions on the issue before a final consensus was achieved. The issue of anti-microbial resistance (AMR) should be seen holistically as a “development challenge” instead of narrowly interpreting it as a health security challenge, India said at a Committee A meeting before asking for more time. “Emphasis should be on raising awareness, infection prevention, promoting rational use of antibiotics and addressing the needs of developing countries in strengthening access to health care facilities, promoting availability and affordability of existing and new antibiotics, diagnostics and vaccines,” India stated. The adoption of the AMR means, among other things, all member states are expected to have in place, within two years of the endorsement of the draft action plan by the Health Assembly, national action plans on AMR aligned with the global action plan. The national actions should include developing a national surveillance system for antimicrobial resistance to collect data on resistance by bacteria to various medicines, and as well as surveillance in the animal health and agriculture sectors, effective regulation and governance for the licensing, distribution, prescription, dispensing and use of medicines in human and animal health, improve laboratory capacity to identify pathogens and their antimicrobial susceptibility in order to guide optimal use by doctors of antibiotics etc. All of this requires considerable financial and technological investment—a burden that low and middle income countries may not have the immediate capacity to carry out. Consider the case of point-of-care diagnostic tools. Often, there is an over-prescription or misuse of, for instance, antibiotics especially in rural areas because of the unavailability of diagnostic tools to find out whether antibiotics are required at all. The availability of such diagnostic tools especially in least developed countries will be a challenge that the more developed countries will have to undertake. Kenya, for instance, raised the question of financial and technical assistance for diagnostic tools in agriculture. Developing countries and health activists have been concerned about resources for implementing AMR plans, particularly, affordable, point of care diagnostics to inform health practitioners and veterinarians of the susceptibility of pathogens to available antibiotics. They have argued that the draft in its current form emphasizes surveillance but doesn’t mention any financial commitment crucial for developing countries to implement the national plans. India also pointed out that there is not only a need to accelerate R&D for new antibiotics, since no new class of antibiotics has been developed in the last 30 years, but also for the global health body to ensure the affordability of new antibiotics. Currently, most major pharmaceutical companies have stopped research in development of new antibiotics; a situation described by WHO’s consultative expert working group (CEWG) on Research and Development, as a “serious market failure”. “It would be terrible if the present antibiotics don’t work anymore and when new ones are developed, the patients in developing countries cannot have access to these, because they are patented and thus have high prices,” said Martin Khor, Director of the South Centre, an inter-governmental body of developing countries based in Geneva. India had earlier in an EB meeting in January this year called for de-linking the cost of investment in R&D from the volume of sale. In the same meeting, they had also indicated the role of pharmaceutical industries in unethical marketing practices that may lead to overdose in antibiotics--which the draft GAP on AMR does not address. India also co-sponsored a related resolution on GSPOA that saw heated debates in the Health Assembly. However, it was adopted with the consensus “to promote new thinking in innovation and access to medicines, which would encourage needs-driven research rather than purely market-driven research to target diseases which disproportionately affect people in developing countries”. In May 2015, WHO announced the inclusion of 16 cancer drugs on the WHO Model List of Essential Medicines (EML) including such costly treatments as trastuzumab and imatinib. “The WHO EML is often used as a benchmark for priority-setting and procurement decisions. As countries wrestle with affordability issues, they should be encouraged to seek WHO technical assistance in using lawful pathways to ensure that these treatments are widely available by regulating or eliminating monopolies-including through the granting of compulsory licences,” said Thiru Balasubramanium of Knowledge Ecology International (KEI). “The first question addressed would be on how to achieve better transparency of the true cost of R&D of cancer drugs (for example - on small molecule and biosimilars, clinical trials and the disclosure of public funds). The second question would focus on how we should implement effective mechanisms delinking the cost of R&D from the price of cancer treatments, and providing life saving medicines to cancer patients in all countries. 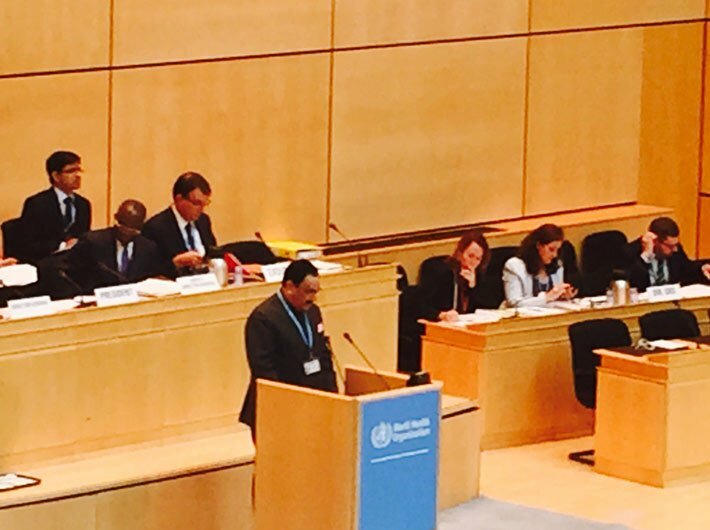 Without delinkage, we will never achieve universal health coverage and resilient health systems will remain but a distant hope,” he told the WHA. Consensus was reached on the wording of the proposed AMR resolution, and it was re-submitted to the Committee that approved it without further amendment on May 23. Some concerns of India and other developing countries have been included in the amended text that highlights the challenges that poorer parts of the world face in “improving affordability and universal access to quality, safe and effective antimicrobial medicines and diagnostic tools”. The WHO under the amended AMR resolution will attempt to contain AMR “including through the tracking of resource flows for research and development on antimicrobial resistance in the new global health research and development observatory”. Also, the GAP resolves to promote “affordable access to existing and new antimicrobial medicines and diagnostic tools”, taking into account the needs of all countries, and in line with the GAP on AMR, “and to report to the sixty-ninth World Health Assembly”. The amended text also purports to provide support and technical assistance to countries, “with a specific focus on low and middle income countries”. Given that WHO is the only legitimate body playing the watch dog for the global public health regime, one hopes that narrow concerns will eventually be trumped by the pursuit of the greater common good.